I have almost completed this painting. 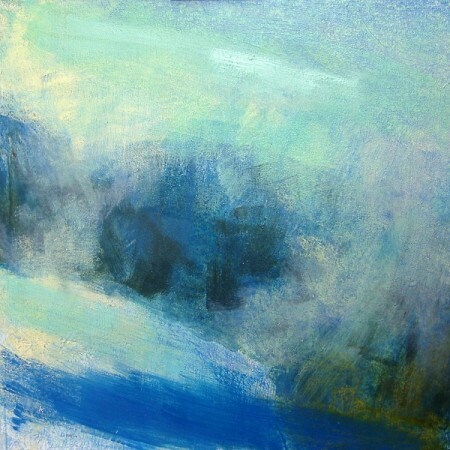 Based on a smaller piece I did a number of years ago, this piece tries to develop the more abstract nature of the view. On the afternoon in question, we’d climbed the hill in driving snow and buffeting winds. It really wasn’t very pleasant and we came close to turning back at one point. The forecast though had said the band of snow would be short lived and pass through after a couple of hours. The snow stopped as we arrived at the summit and after a short while the cloud started to break. We got glimpses down into Cononish glen and across to Ben Lui and Beinn Chuirn. I think this piece is finished but I’ll need to let it sit now before I’m sure. I have though signed it and I doubt there’ll be much more work done on it. This photo was just a quick ‘snap’ so please excuse the poor image quality ….I’ll get it photographed properly later.